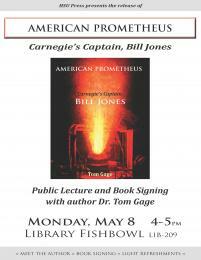 HSU Press presents the release of American Prometheus: Carnegie's Captain, Bill Jones by Dr. Tom Gage with a public lecture and book signing on Monday, May 8th from 4-5pm in the Library Fishbowl. Come meet the author, get your book signed, and enjoy light refreshments. Read more about it on Humboldt State Now: Historical Look at a Steel Industry Giant.